Well, Fishing at Port Huron finally had a payoff for us…. The day started off around 8:00 AM at 12 degrees and warmed up to around 20 degrees by 3:00 PM. Cold, but worth the time outside! I got a new Rod and Reel combination for Christmas – a Bill Dance Spinning Reel Catfish Combo. It’s a medium to heavy weight pole and an open face spinning really. Pretty much what I was looking for to fish there in Port Huron. I got my fish at 8:30 am on the first cast with my new rod and reel. What a nice treat! The only think I don’t like about the combo is that I’ve not been able to figure out how the reverse on the reel works. Normally there is a switch on the reel that prevents it from going backwards; however, this one does not have that kind of a switch. It will lock, but I’ve not quite figured out what makes that happen. The second fish we took around 2 PM – we were just discussing leaving for the day and then the rod went crazy again. Both very nice fish… it will make fore few nice meals. I took a day off on Monday and went fishing in Port Huron with my neighbor. We had a great time – the temperature was in the 40’s and there was virtually no wind (well at least that we felt). The wind was only a couple of miles an hour and out of the west so behind the building we were out of it. The water was very clear today and a beautiful blue color. I’m still amazed at how clear it is and that you can see the bottom 30 feet down. The past few times, it was out of the east or the north and you got cold after a few hours. We tried fishing the other end of the area that we had been fishing. The current was much faster in that area. We went from 2 oz. to 8 oz. of lead and the line was still being moved by the current. When we were talking to the guy at the bait shop he told us that we should be using 1.5 lbs. to 2.0 lbs. to fish in that part of the river. Unless we come further down the wall where the current slows down. I think we found the sweet spot on the sea wall to fish. Based on the four times we’ve been there on spot on the wall always seems to yield a catch while we are there. Next time, that’s where we are going to start out. We were talking to a fisherman at that spot on the wall when his rod bent over – fish on! He was able to bring in this 27 inch Steelhead and we helped him land it with the net. Once we got it on the deck, he asked us if we wanted it…. he had caught another one about an hour earlier and he said he would only eat one, because he had a freezer full of Walleye at home he did not want another steelhead – he thought the Walleye tasted better. He also shared some of how he was rigged up with his pole, so some new ideas to add to our next fishing trip! 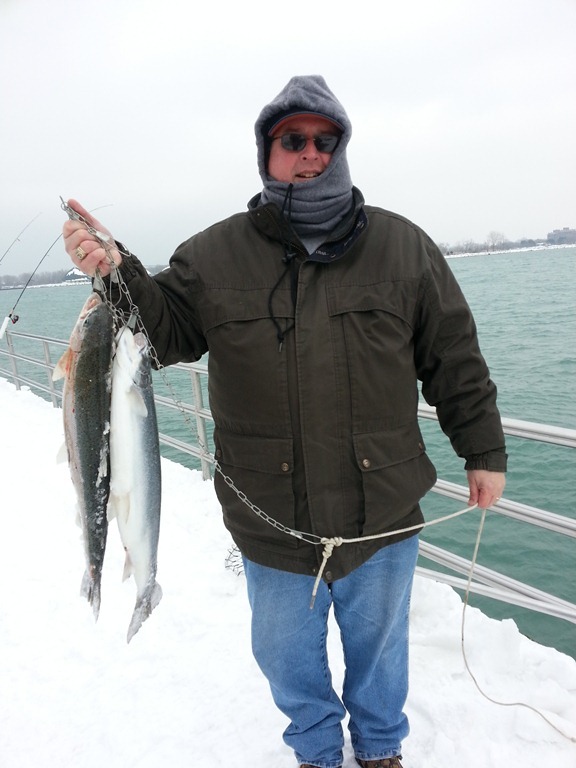 Went Fishing again in Port Huron and had a good time – for December it was not too bad with temperatures in the the 40’s; however, with the 7+ Mile an hour wind it seemed much cooler. We were able to talk to some other fishermen there and there were some that had caught fish that morning (one really nice Brown Trout) just down the walk from where we were. So we know there are good fish there; however, we did not catch any. We did have about an hour or so where we were getting some bites… but not quite able to get one hooked! The day started out kind of foggy and damp, but not all that unpleasant. There was a “jingle bell run” going on for the first hour or so while we were there. Towards the end of the morning, the sun started to peak out and it looked like by the afternoon it might be much nicer. But your really can’t complain about this type of weather in December can you? While we were there, I took several pictures of ships as they passed by – it gives you the scale of the water we are fishing on the St. Clair River. This is the same ship a little closer up – you can get a better sense of how much water it is pushing as it moves up river (against the current). You also get a sense of how long it is and it takes some time to pass through the viewfinder of the camera. I went fishing again this morning over in Port Huron. It was a cool crisp morning about 39 degrees out with a 7 – 8 mile an hour breeze from the North West. There was a band of dark clouds over Sarnia, Canada that was moving along the shoreline coming in off Lake Huron. We had about two hours there on the pier where we had the sun peeking in and out of the clouds. The sun felt so good when it would pop out for a bit. The water was really muddy (not like last week where it was turquoise blue. Joe (my fishing buddy) got a couple of bites, but no solid hits. We talked to a guy that caught a 20 lbs steelhead on Wednesday night where we were fishing… but no luck for use. We did not see anyone catch anything this morning. Right before we left, we had a snow shower that came through and it was like big wet snow flakes for about 5 min. It was kind of neat being there fishing in those conditions!